What’s better than a Thanksgiving meal? Leftovers! Use leftover mashed potatoes in these gluten-free savory mashed potato cakes for a real treat! You’ll love the added bacon and green onions for extra flavor and the crisp crust on each of these mashed potato cakes. It’s that time of year again! Are you a person that puts your Christmas decorations out before Thanksgiving is even over? Personally, I’m waiting until the weekend when Thanksgiving is all over for that stuff. One holiday at a time, right? I will admit I’ve been watching Hallmark movies galore and have even turned on the Christmas music in the car for my long commutes from work every once in awhile. Thanksgiving is one holiday I want to make sure I don’t pass over quickly though. It’s all about giving thanks, spending time with family and friends, and eating lots of good food. This can sometimes be tricky for those of us who eat gluten-free. I put out a round-up last year of 30 recipes for a gluten-free Thanksgiving if you’re still in need of a few recipes to round out your meal. I’m lucky enough that my family is very understanding and helpful and have Thanksgiving down to a science now. We have two turkeys – one will be stuffed and the other gluten-free turkey will go on the grill (sooo good!). I’ll get my own little portion of mashed potatoes and sweet potatoes after they’ve boiled on the stove so I can doctor them up dairy-free style (yay for being naturally gluten-free!). I’m making my own stuffing which will be on the blog tomorrow night which I know doesn’t give you a ton of time to make it but in case you need a recipe on Thursday morning, I’m your girl. Christmas stuffing can be a thing too, ya know. And then I’m making my own pie! Full of ganache and vegan caramel… mmm you’re going to love the recipe when it makes it’s way to the blog! With a little planning, Thanksgiving can be relatively stress-free for us gluten-free eaters. Just remember, don’t eat the turkey if it has stuffing in it and try to be the first in line so that shared utensils between dishes aren’t an issue. And that mashed potatoes will probably be your best friend. Luckily for me, mashed potatoes were always my favorite part of Thanksgiving. Turkey was okay, but the mashed potatoes were where it was at! I love using leftovers from Thanksgiving to transform them into something new the next day. Last year, I shared my mashed potato waffles with bacon and green onion. This year… well I’m sharing almost the same thing in a different form. Apparently I really love mashed potatoes with bacon and green onion. What’s not to love though? It’s the perfect combination. These little gluten-free savory leftover mashed potato cakes are so delicious you’ll wish you had them at Thanksgiving dinner. They’re crispy on the outside, and fluffy mashed potato goodness on the inside. The green onion really takes the flavor up a notch. I started with dairy-free mashed potatoes to keep mine dairy-free, but you can always use regular mashed potatoes and maybe even add in 1/4 cup of cheese to amp it up even more. Take out the bacon and you have a vegetarian treat. So many possibilities with this one! Depending on what’s in your mashed potatoes you may want to add salt, pepper or garlic powder to these little cakes. But it’s all up to you. Since there are no eggs in this recipe, you can try the mixture to see if you like the flavor before adding more spices. Have a Happy Thanksgiving and remember to use up those leftovers! What's better than a Thanksgiving meal? Leftovers! Use leftover mashed potatoes in these gluten-free savory mashed potato cakes for a real treat! 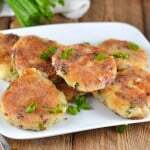 You'll love the added bacon and green onions for extra flavor and the crisp crust on each of these mashed potato cakes. In a bowl, mix together all ingredients except the 1 tbsp of flour and oil until combined. Divide mixture into 8 balls. Lightly press them into flat disks. Add 1 tbsp of flour to a plate and dip each disk into the flour on both sides. Preheat a large skillet over medium high heat. Add 1 tbsp of oil. Cook half of the cakes at a time, 4-5 minutes on each side, until they are golden brown. Repeat with remaining cakes. Hi Elizabeth! I have tons of gluten-free and dairy-free recipes available on the blog. I don’t do much with egg whites since I have an egg intolerance. But if there are any recipes in particular you are looking for let me know and I’ll point you in the right direction or add it to my list of recipes to create! Happy eating!